Cognitive and Behavioral Neuroscience is a joint major between the Department of Cognitive Science and the Department of Psychology. Students may choose to be advised by either department. The B.S. in Cognitive and Behavioral Neuroscience will appeal to students who are broadly interested in understanding links between neural activity and perception (e.g., color vision, attention), basic behaviors (e.g., appetitive drives), and higher level cognitive function (e.g., working memory and executive function) using multiple tools ranging from single-unit physiology to functional magnetic resonance imaging (fMRI) and electroencephalography (EEG). Cognitive and Behavioral Neuroscience uses scientific tools and concepts: knowledge of formal systems such as logic or calculus, probability theory, computer science, chemistry, biology, physics, and statistics. Accordingly, students in upper-division courses must have an adequate background in these topics. Lower-division courses for the major should be completed by the end of the sophomore year. These requirements will guarantee an adequate background for the topics of the upper-division CBN courses. * Preferred calculus courses critical for the success of students who plan to pursue mathematically intensive areas of CBN. * Preferred computer programming courses critical for the success of students who plan to pursue research careers in Cognitive Science or Psychology. By petition MATH 11 will be accepted for the major. 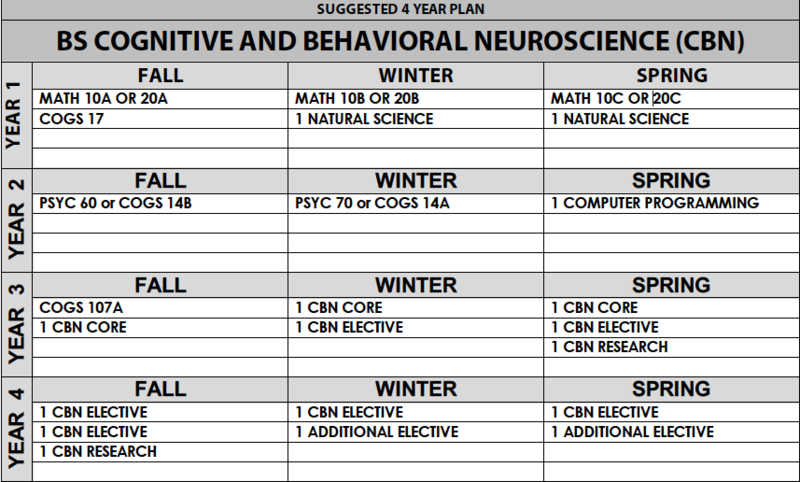 Note: All lower-division courses must be passed with a minimum grade of C- or P.
*Successful complete of either PSYC 194ABC or COGS 190 A/B/C/D (Dept. Honors) fully satisfies the research requirement. **If the two research courses are 199s, at least one of them must culminate in a research paper approved by the faculty advisor and submitted to the corresponding department's Student Affairs Office prior to graduation. Please see the corresponding department for more information. All upper-division courses numbered 100-193 must be taken for a letter grade and a minimum grade of C- is required for the course to count toward the major. Courses taken Pass/No Pass cannot count toward the upper-division CBN major requirement. Excluded from credit towards the major are graduate seminars (2XX). A maximum of three upper-division psychology courses may be taken outside of UC San Diego (see Petitions).